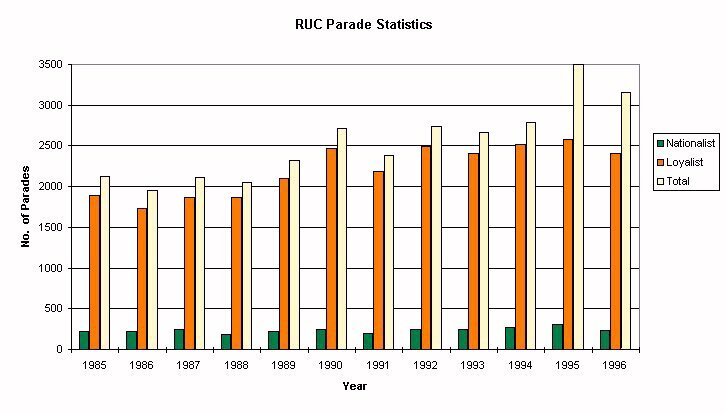 The statistics below illustrate the number of Loyalist and Nationalist parades which have taken place annually in Northern Ireland over the past ten years. The figures have been taken from the Report of the Independent Review of Parades and Marches (page 30), and were initially obtained from the RUC. (ii)Who should make decisions regarding Parades and Marches in Northern Ireland? In September 1996, an Omnibus Survey was conducted in Northern Ireland, partly commissioned by the Police Authority. It included twelve questions on Public Attitudes to Policing. One of these referred to the question of responsibility for decisions regarding controversial parades in Northern Ireland. 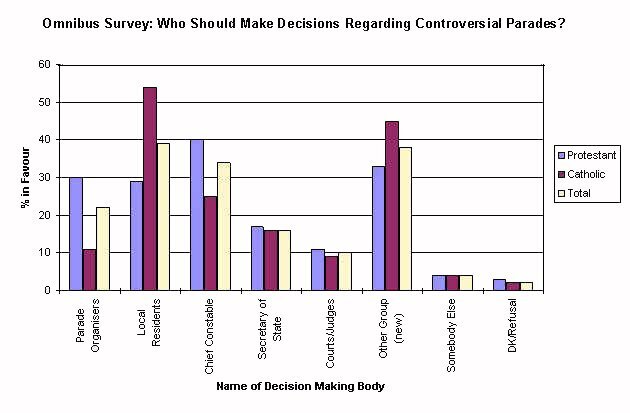 The graph below illustrates the responses of Catholics and Protestants to the various decision making bodies suggested. The figures have been taken from the Report of the Independent Review of Parades and Marches (page 70).